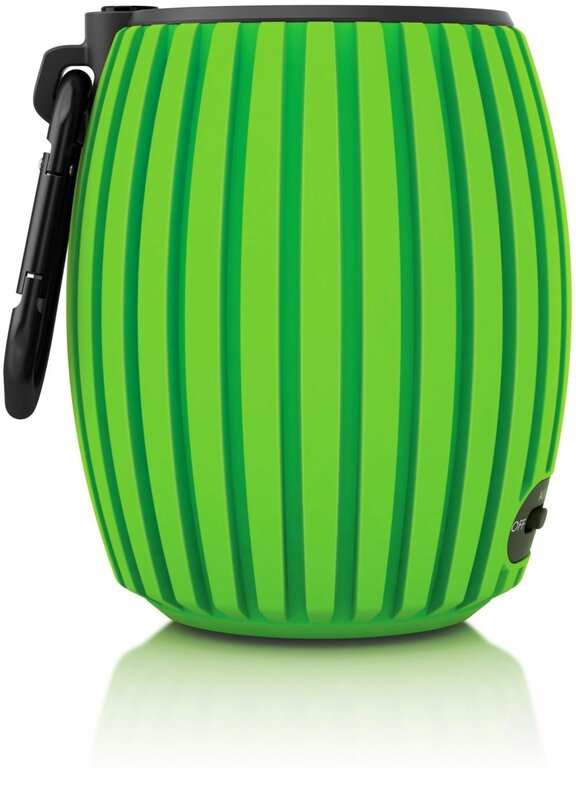 The SoundShooter is a unique grenade-shaped Bluetooth speaker made by Philips and is intended with ultra portability and rugged features in mind to suit those who are actively outdoors and want a portable Bluetooth speaker at a budget price point. The SoundShooter really is a tiny speaker with dimensionsphilips-soundshooter of 2.6 x 2.6 x 3.2 inches inches and weighing in at only 1.6 ounces it really is ultra portable. The exterior is made from a thick rubber polymer so dropping the speaker or being rough will likely cause it no damage. The speaker feels really good in the hand and the speaker comes with a carbine so its easy to strap to your belt or bag and you will hardly feel it there at all. The size, weight and clip make it very easy to do various fast paced activities. The speaker is very minimal with only a switch at the back that allows you to turn the speaker on into Bluetooth mode and aux mode allowing you to listen to the speaker in wired mode and Philips does include a special cable that works as a aux cable and a micro USB charger. Beside the switch you will find your micro USB port that is used to charge the speaker. The internal lithium battery is able to keep the soundshooter alive for up to 8 hours of play which is considerably good seeing how small the speaker is. The Philips SoundShooter does have the ability to be used as a speakerphone which is a hard to find feature on most sub $50 Bluetooth speakers and the speakerphone functionality works well with both parties being able to hear each other without any problems. The Philips SoundShooter definitely impresses with its ability to project pretty loud sound from such a tiny speaker. We really didnt expect it to sound the way it did. Keep in mind this is a sub $50 speaker so what you will hear will still resemble the size and price point. The speaker plays music nice and clear until it reaches its max volume levels then you will start to hear the speaker struggling to produce clear and non distorted sound. The sound is fairly loud and you will have no issues hearing it while you are outdoors and engaging in fast paced sports. As far as bass goes it is theresomewhere.. but dont expect to be blown away. All in all the sound is better than most tiny sub $50 dollar speakers and we would say you are getting your moneys worth with the Philips Sound Shooter. The Philips Sound Shooter is a very convenient little speaker. Designed well and easy to grab and go, it will be liked by many sport savvy and outdoorsy people. In addition to convenience we think the sound is rather good in terms of price point and size of the speaker. additionally there are hundreds of reviews on Amazon of satisfied customers so we can safely say you will not be disappointed.